Imagine a hidden valley where dusky oaks crowd a canyon bottom, where the hills loom blue with ceanothus and the boulders bake in the sunshine. 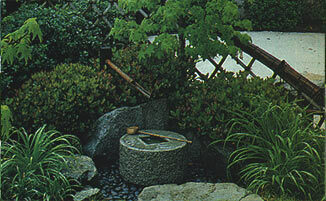 It is a garden created by master Landscape Architect Takendo Arii. 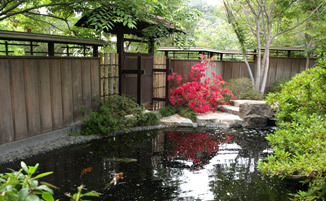 Mr. Arii creates distinct Japanese-style gardens and can design and create a unique garden that will perfectly match your taste. Whatever you envision, Takendo Arii can bring it to life. 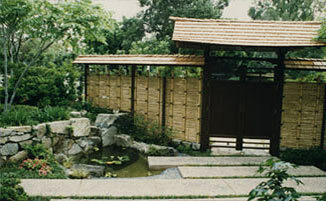 Takendo Arii specializes in construction and renovation of upper-end commercial and residential landscapes that benefit from traditional Japanese-style designs. Welcome to my site! "I strongly recommend Mr. Arii to anyone who is planning to design and landscape a garden. He is a true artist who is precise and painstaking in creating a glorious setting." "In forty years in business, I have dedicated many letters of recommendation, but never one of for a person like Takendo Arii, who has made the most important and the most lasting contribution to the "Golden Door." Arii's great masterpieces of art are not inexpensive, but they last and grow in beauty and value. I'm sure you will find your investment worthwhile." "Mr. Arii not only is a talented landscape designer, but was also one of the most dedicated employees Sea World has had. I believe Mr. Arii would make and excellent employee for anyone needing his special talents in the landscaping design area."